King Philip II. Carta de Hidalguia, in Spanish. 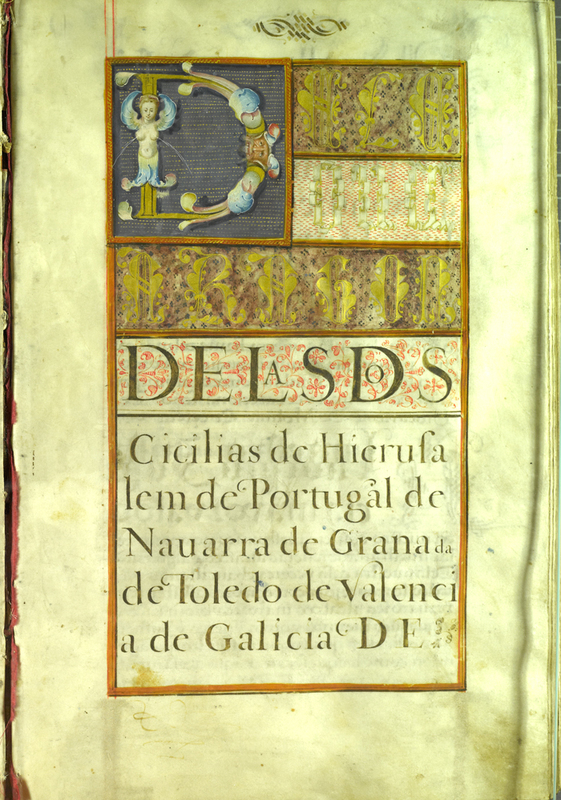 16th-century manuscript on vellum, granted at Granada and dated 9 July 1588. Bound in original brown gilt Moroccan, with seal attached. 3 illuminated preliminary pages. The Virgin Mary is depicted as the Mulier Amicta Sole (or the Woman Dressed in the Sun) from Rev. xii 1 on the second folio of this court document. She is standing on the moon with the rays of the sun emanating from her. The scriptural reference was originally understood to mean the Church, although as early as the 6th century the woman had been identified with the Virgin. By the late medieval period, this identification had become universal. Note the rosaries that the infant Christ holds. 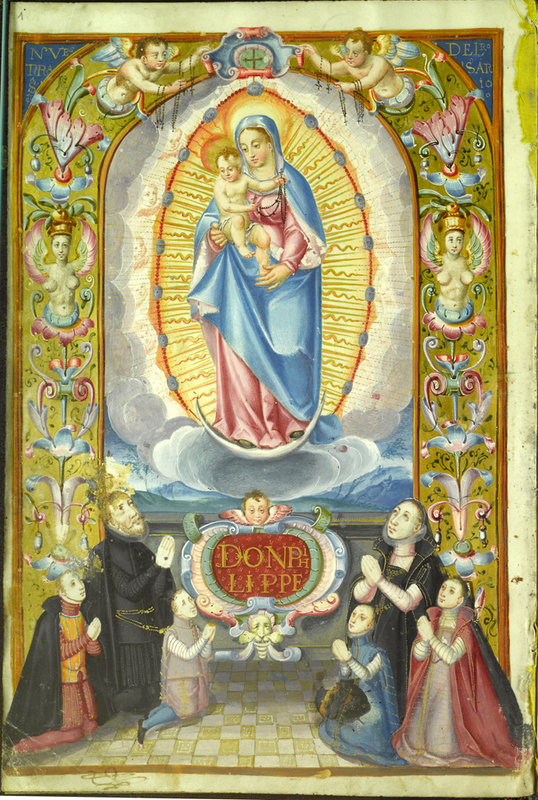 Ortiz and his family are placed in the traditional donor position below the Virgin.The cartouche below the Virgin reads Don Philippi, a reference to Philip II. 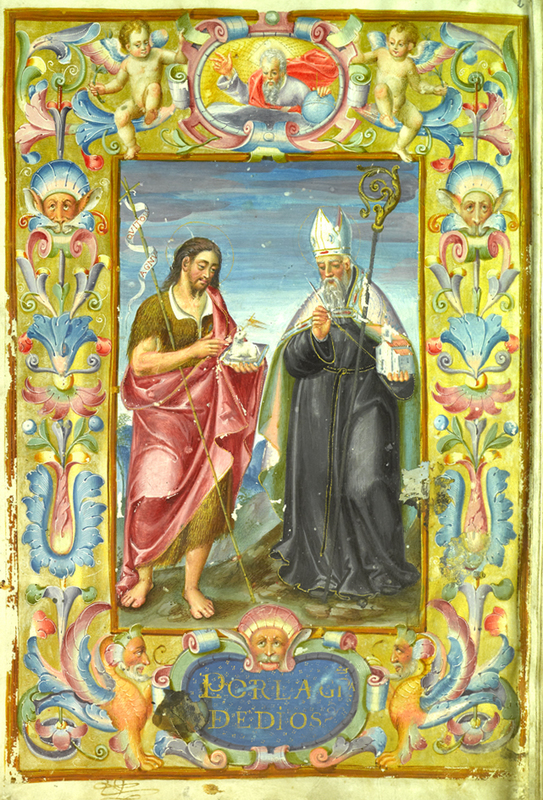 On this page are representations of the family's patrons, St. John the Baptist shown pointing to a lamb representing Christ, and St. Augustine holding a church. The Cartouche below the saints reads Por la Gratia de Dios, by the grace of God.